Liatris is a small genus of flowering plants from the North America where they grow natively in ravines and grasslands where they can sufficiently moist soil. Gardeners and horticulturists grow Liatris for its beautiful flowers. Most species of Liatris are characterised by narrow, grass-like foliage and long spikes of flowers that appear in later summer. 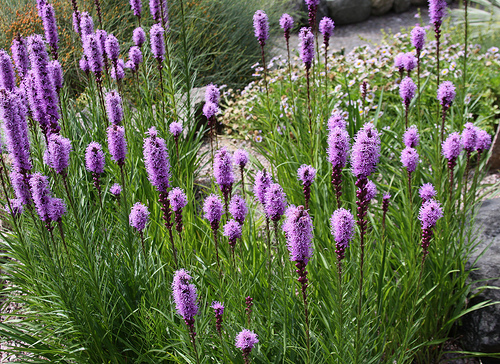 The fuzzy pink or purple flowers of Liatris grow along erect spike that reminds of bottlebrush. These flowers usually bloom from top to bottom and stay fresh for quite a long time. From a number of popular species, Liatris spicata is the one that is grown widely in gardens and landscapes. It is commonly known as Blazing Star or Button Snakewort. Liatris spicata has linear growth as it can grow up to 1 meter in height. The plant prefers full to partial sun and moist but well-drained soil. Overwatering, especially in winter, can kill these plants therefore good drainage is essential for growing these lovely perennials. Therefore, a sandy loam is the best media to grow this lovely bloomer. Most species of Liatris can be grown in containers too. So if you are looking for a low-maintenance summer-blooming perennial for your balcony or small garden Liatris spicata should be on your list.